Description: Hold onto your hats... Nana Vic and Mr Jones are laughing up a storm as they ride the blazing roller coaster. These two are never going to let age become a barrier as the continue to enjoy life. What's next? 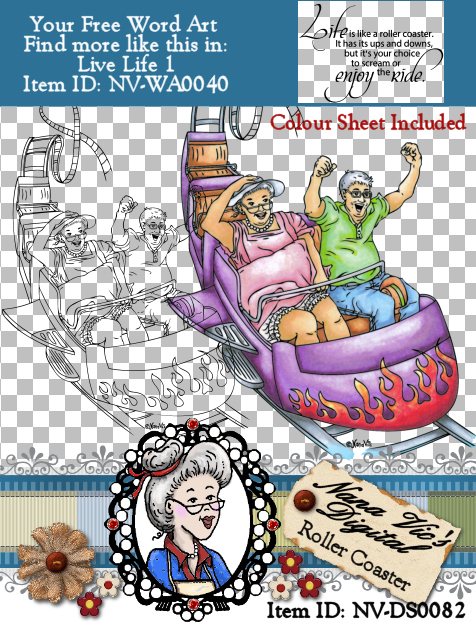 Use this fun digital stamp on your scrapbooking, card making or country crafting projects. The colour topper is included with this set for a quick and easy creation. 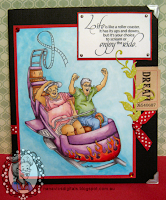 Bonus word art included is from: NV_WA0040 Word Art ~ Live Life 1. The automatic download contains a JPG and transparent PNG line art files, a colour PNG file, word art is a PNG and the cover JPG image. All are in 300 dpi for easy re-sizing or flipping. what a great image... and the sentiment is perfect. A great reminder to seize the day! Whoooo Hooo...go Nana Vic and Mr Jones!!! These two certainly don't let the grass grow under their feet. I just love the expressions on their faces....totally enjoying the ride. And that sentiment is just so perfect for it.